According to the Washington Post, the Trump administration is considering a new child care proposal based on expanding the existing Child and Dependent Care Credit and creating tax-free accounts. This change in direction comes after a recent analysis by the Center for American Progress showed that the administration’s previous proposal for a child care tax deduction would have disproportionately helped wealthy families and left working class families with as little as $5 in savings. But while families across the nation desperately need a better plan to make child care more affordable, Trump’s latest proposal isn’t the answer. Investing in early care and education (ECE) yields positive benefits for everyone: children can be cared for in nurturing educational environments that will help them begin school ready to learn and grow into productive citizens; parents can go to work with the peace of mind that their children are in good hands and be even more productive employees as a result; and employers reap the rewards of more productive employees—both now and in the future. 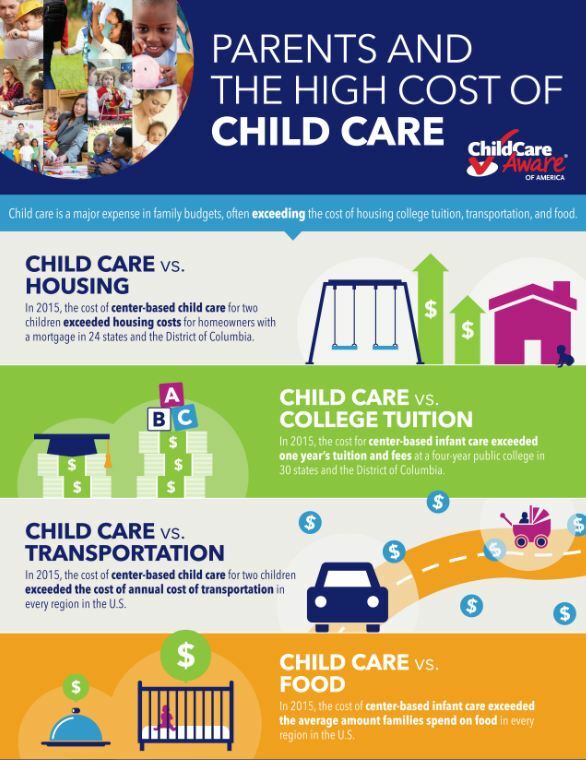 The United States needs to make a significant public investment in early care and education. ECE employees and their families are long overdue for an increase in the wages and benefits of this critical work. And raising the quality of jobs in the ECE workforce will have a major impact on producing the high-quality care that children need to have a real chance to thrive in school and in life. The proposal Trump outlined in his tax bill is too little, too late, for too few. Under a tax credit program, families have to pay upfront for child care and only reap the financial savings at the end of the year after filing taxes. Low-income families generally have less than two weeks’ income between their savings and checking accounts and cash on hand. Families can’t wait an entire year to get help paying their child care bills. And for those whose incomes are too low to have tax liability, a non-refundable credit will not help. Even a partially refundable credit (as Trump appears to be considering) would not put much of a dent in the hefty child care bill facing most families. Tax-free savings accounts (which also may be on the table) have the same problem: If you don’t have money up front to put into an account, you won’t receive any benefit. The people who will benefit the most are wealthier families who can use it as a tax shelter. The proposal Trump outlined in his tax bill is too little, too late, for too few. The investment of hundreds of millions of dollars on a poorly targeted tax plan will take away from investments that should hold a higher priority. The cost of full-time center-based care for infants—which exceeds payments for rent and college tuition in many states—means that families at or below the Federal Poverty Level (FPL) are paying between 24 percent of their incomes in Mississippi to 85 percent of their incomes in Massachusetts for child care alone. And with the out-of-reach costs of child care throughout the country, middle class families are struggling with these bills as well. Tackling this problem will require expanding and guaranteeing federal assistance to reach both low-income and middle class families. (The current child care subsidy program—the Child Care and Development Block Grant—is only for low-income families and currently only reaches 1 in 6 eligible families.) Delivering universal pre-K programs to three and four-year-olds—as put forth by Mayor Bill de Blasio—is an example of the kinds of bold steps that Congress must support to deliver the developmentally appropriate early education that young children need to have a fair shot at fulfilling their potential. The tax proposal also does nothing to invest in the ECE workforce. In 2016, child care workers were paid an average wage of just $11.02 per hour—wages on par with fast food cooks and cashiers. Trump’s tax credit would be paid out regardless of the wages paid to teachers or the quality of care. Instead of helping to ensure these jobs—the demand for which is growing in the United States, especially since they can’t be outsourced or automated—become jobs that pay a living wage, his proposal leaves this important workforce behind. As much as half of the $6 trillion in tax cuts proposed by Trump would go to the top 1 percent wealthiest American families. That’s money that could be invested in direct child care subsidies to working families and universal pre-K. Stepping back, the flaws of Trump’s tax plan come into plain view. As much as half of the $6 trillion in tax cuts proposed by Trump would go to the top 1 percent wealthiest American families. That’s money that could be invested in direct child care subsidies to working families and universal pre-K. Real government investment, not budget-busting tax cuts for the very wealthy, is what will be needed to support parents and children. Families need leaders to provide these kinds of real solutions so parents can go to work with the peace of mind that their children are safe and happy. Improving Equitable Access to Dual Language Immersion Charter Schools in Washington, D.C.
Julie Kashen is a senior fellow at The Century Foundation with expertise in working families, economic mobility, labor, and poverty.